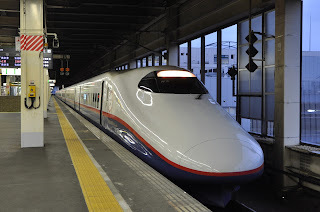 The Japanese Shinkansen or 'Bullet Train' is probably the most famous high speed train system in the world. 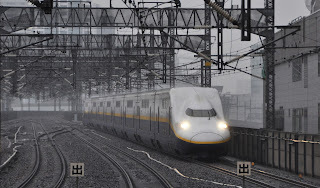 When the Tokaido Shinkansen opened in 1964 between Japans two largest cities Tokyo and Osaka it was the first dedicated high speed railway in the world with trains running at speeds of up to 130mph. The Shinkansen (translating as 'new trunk line') was built to standard gauge- a first for Japan which has traditionally used a 1067mm narrow gauge system due to its mountainous terrain. The original 'bullet trains' (all now withdrawn), nicknamed because of their iconic shape, ran two standards of service named 'Hikari' with limited stops or 'Kodoma' stopping at all stations between Tokyo and Shin-Osaka. helpfully alternate between Japanese and English. Today the network has been expanded to cover most major cities on the islands of Honshu and Kyushu. Service speed has been increased up to a maximum of 300mph which is possible on parts of the Tohuku Shinkansen. The Tokaido route, which is still by far the busiest carrying up to 13 trains in each direction per hour now reaches speeds of 168mph shortening the journey from Tokyo to Osaka to just 2 hours 25 minutes on the fastest 'Nozomi' trains. Since privatisation of the JR network in 1997 the Shinkansen network is now run by several companies: The original Tokaido Shinkansen is owned by JR Central, the Sanyo extension from Shin-Osaka to Hakata is owned by JR West, The further continuation of this line onto Kyushu is owned by JR Kyushu while the various northern branches from Tokyo on the Tohuku and Joetsu Shinkansens fall under the banner of JR East. A Tokyo bound 700 series set enters Odawara station. stations to allow faster 'Hikari' and 'Nozomi's' to pass. With the quest for speed and efficiency the private operators have now replaced all of the older Shinkansen sets delivered by JR before privatisation. There is now an interesting and varied fleet of high speed trains operating on the Shinkansen lines of Japan- though in the authors personal opinion none really come close to the aesthetics of the original 'Bullet' trains. 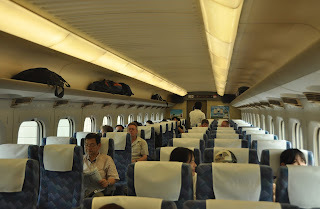 which work commuter services to the north of Tokyo. 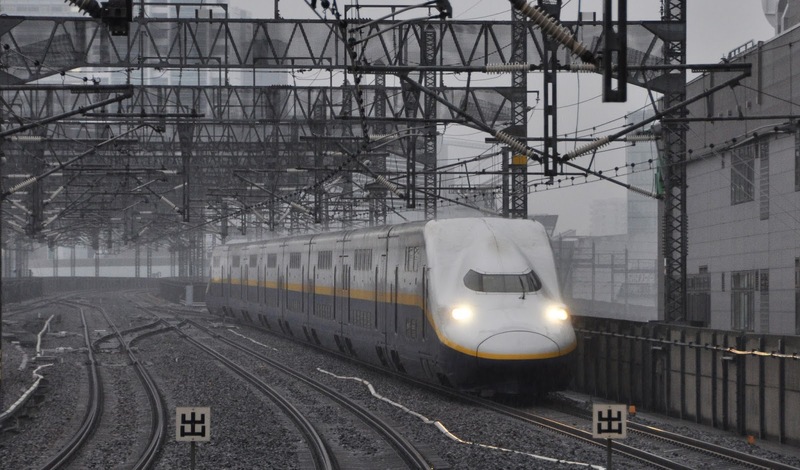 This train is seen at Omiya at the tail end of a thunder storm! Several Further Shinkansen projects are still underway to expand the network. 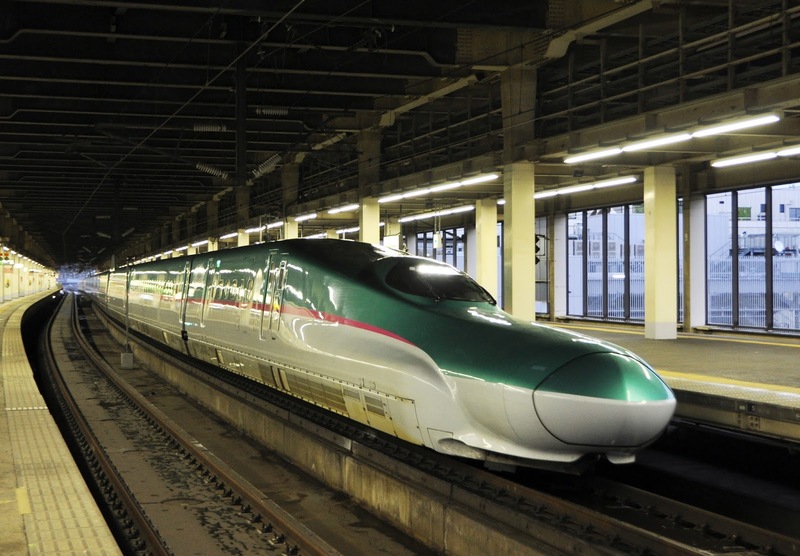 A link to the northern island of Hokkaido is under construction and there are also plans to extend running of some Shinkansen trains on to more traditional routes with several solutions to the issue of the change of gauge. Omiya before its final approach to Tokyo. 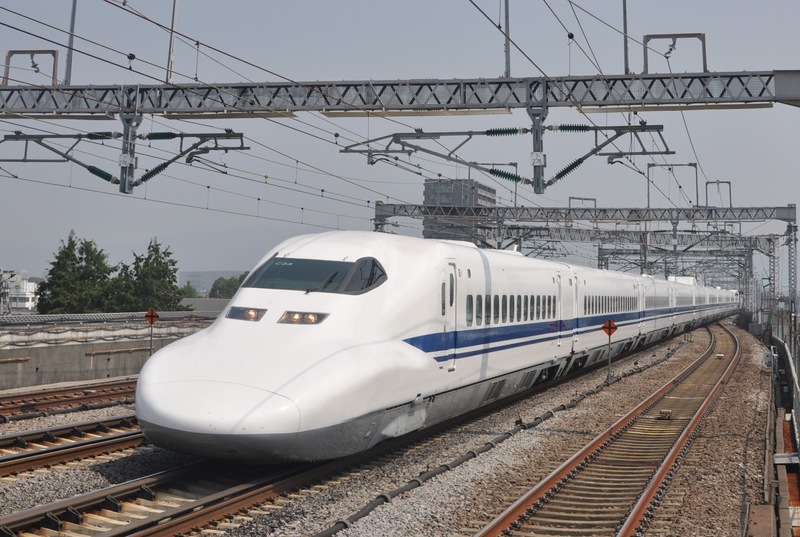 The most exciting of all the future projects is perhaps the proposed new Chuo Shinkansen which will see Maglev technology used over a long distance for the first time. Construction of this new line is due to commence in 2014 with the first section from Tokyo to Nagoya scheduled to open in 2027. Trains will travel over the initial 177 mile route in just 40 minutes attaining speeds in access of 310mph. 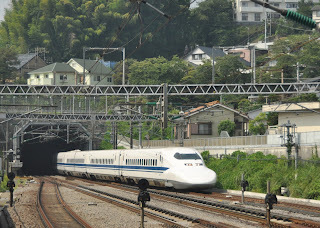 The JR East E5 is the latest addition to the Shinkansen family. service in 2011 and are still being delivered as of 2013. A Tokyo bound train is seen at Omiya.